Despite being the penultimate day of November, yesterday was a stunner. The shining sun against the bright blue sky, usually a harbinger of frigid temperatures, beckoned me out to the fifty degree day. I donned a mere long-sleeved tee and fleece vest, long pants and sneakers. No hat, gloves, scarf or jacket. I started my walk. A brisk walk. A brisk day. Heading towards the river. Admiring the few remaining flowers adorning my neighbors’ yards, here a yellow rose, there a few hydrangeas holding on to the vestiges of their dusty pink and blue before browning. Crisscrossing the river, hopping from bridge to bridge, I did everything I could to stay in sunshine. My face chasing the sun like a field of sunflowers, happy when the sun emerged from behind buildings as I walked, and only turning to make my way home when the sun was definitively behind me. 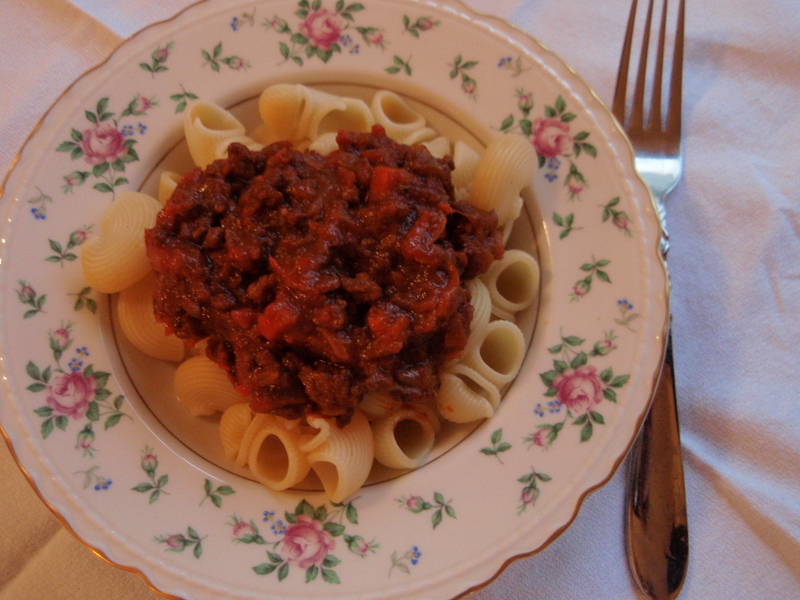 Knowing that the week would be a bit more dreary, I decided to make a hearty meat sauce, similar to a Bolognese, when I got home to fortify me for the next few days. I have no pretensions of making a true Bolognese sauce, but I got some inspiration to spice up my normal meat sauce with the addition of vegetables and wine. Prepare the vegetables: Saute garlic, onion, carrot, and celery in olive oil over low heat until soft, approximately 20-25 minutes. Remove vegetables to bowl. Prepare the meat: In the same pan, saute ground beef over low until brown, about 7-10 minutes. Add tomato paste and stir well. Then add tomatoes, sauteed vegetables, and red wine. Simmer and simmer and simmer: Allow the meat and vegetables to simmer over low heat for at least 2 hours, stirring occasionally and adding water if the sauce gets too thick. The liquid should reduce down by about 1/3, leaving you with a thick, rich hearty sauce for your favorite pasta. One of the qualities about which I am least proud is my tendency to leave certain things to the last minute. Humanities papers in college (but yet studying for my science or math exams well in advance…?). Switching my purse to match my outfit when I’m leaving the house and already late. Buying ingredients for a shabbat meal even though I’ve planned out a menu for days. But, I still didn’t believe it. So, they close on Fridays 6 hours before sunset, clearly they don’t REALLY expect people who work to actually be able to conduct all of their shopping on Wednesday or Thursday evenings before 8 or on Sundays before 4. And when a holiday starts on a Thursday evening, they close at 2 pm as well. I found this out when I called at 3 pm on that fateful Thursday to check on their hours. In under 2 hours, I had completed my fruit and veggie shopping, returned my ZipCar, and arrived at the Ganz’s door to pick up the roast to defrost for the following evening. Meat would be mine and my guests’ for Friday night. Adapted from Joan Nathan’s The Foods of Israel Today. The original recipe calls for a 5- to 6-pound brisket for 10-12 servings, so I was afraid that a 3 pound chuck roast would not be nearly enough for my 8 guests (so of course I also made chicken) and we ended up having enough leftovers to feed me for lunch for several days. I had never made a chuck roast before and was not familiar with how it might differ from a brisket (and didn’t have much time to research), so I just took a leap and hoped for the best. This roast did not seem to shrink as much as a brisket does. I made a few substitutions (Goya Manzanilla Spanish olives with pits, canned preserved lemons), braised the meat in a pan that is way too big (I need a Dutch oven for anyone who cares), and the only complaint I have is that the roast didn’t quite slice as nicely as was hoping it would. Perhaps I didn’t let it cool sufficiently? The flavors are intense – salty and tomato-ey and quite concentrated. One of the beauties of this dish is that everything can be prepared in advance and the flavors intensify over about a day. Prepare the meat. Pierce skin of the roast with knife in 5 places and insert garlic cloves. Sprinkle with salt and pepper. Heat 2 T oil in heavy skillet or roasting pan. Add the meat and sear on all sides (several minutes each side), then remove. Prepare the veggies. Add 2 more T oil to the hot pan and sauté 3 of the chopped onions until limp. Add all the spices (turmeric, ginger, white pepper, bay leaves), celery, 1 diced tomato, and water to the pan. Sauté for 1-2 more minutes and let cool. Cook the meat. Place roast in the baking pan and surround with the cooked vegetables. Roast the meat, covered, in the oven for 3 hours or until a fork goes in and out of the meat easily (I guess this is what is meant by the term “fork tender”). Periodically check the roast to make sure that there is enough liquid in the pan. If you are using a big turkey pan (like I do since I do not own a Dutch oven…) that does not have a proper cover, you will probably need to check the roast periodically to make sure there is enough liquid. Otherwise, you might (like I did) end up with some lovely caramelized onions and tomatoes (which actually are quite lovely, but might not be quite the effect you are seeking). When ready, remove, cool, and refrigerate, reserving the vegetables. You can prepare this a day ahead of time. Prepare the tomato-onion sauce. Heat the remaining 1T of oil in a frying pan and add the remaining 1 chopped onion. Saute until onions are translucent. Add the remaining 2 diced tomatoes and simmer, covered for a few minutes. Set aside or refrigerate overnight until ready to serve meat. Slice and reheat meat. About an hour before your plan to serve the meat (or once meat has fully cooled — I probably didn’t wait long enough and tried to slice when still warm), cut it against the grain into slices ~1/4-inch thick. Return the slices to the baking an along with the reserved vegetables in which the meat was cooked (the tomato-celery-onion mix). Reheat the meat, covered, in a 350ºF oven for ~ 30 minutes. Complete the sauce. Add to the tomato-onion mixture the olives, preserved lemons, and half of the parsley and cilantro (2 T each). Heat in a small saucepan. Remove the brisket and arrange on serving platter with vegetables (caramelized or otherwise), covered with sauce and garnished with remaining 2 T each of parsley and cilantro. Don’t forget to pluck out the bay leaves. A special thank you to my gracious neighbor who took many process photos during the holiday when cooking is cool, but photo-taking, while uber-tempting for me, is not.